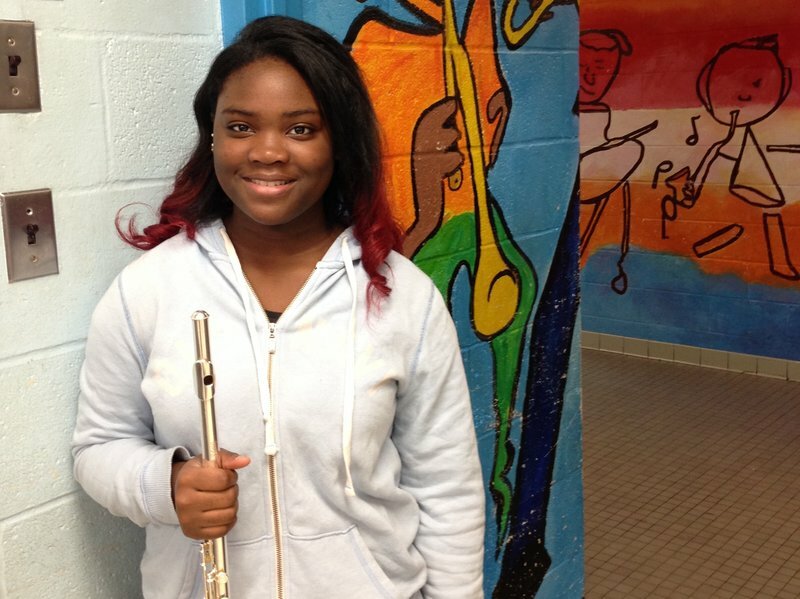 NPR: Asia Palmer now a high-school freshman at the Baltimore School for the Arts, has been with the OrchKids program since it began in 2008. The Baltimore Symphony Orchestra celebrated its 100th birthday earlier this year. In a performance of Ravel's Boléro, the orchestra presented a few members of a new generation of players eager to take the music into a new century. They were members of the BSO's OrchKids program, onstage at Meyerhoff Symphony Hall to play right alongside regular orchestra musicians. Marin Alsop is a regular commentator on NPR; she's also the music director of the Baltimore Symphony Orchestra and a founding director of OrchKids. The program was launched in 2008 with just 30 children from inner-city backgrounds. Now, there are more than a thousand students in the program. But the maestra says playing music professionally is not the goal of OrchKids. "That will just be sort of a fringe benefit," she says. "That's not the point. I think the point is that music becomes this vehicle for experiencing and envisioning themselves with lives filled with possibility. When you walk into Lockerman Bundy [Elementary School] and you hear these kids, and you meet them — I mean, it's all about possibility." Dan Trahey is the OrchKids artistic director. He says the program can fill many needs. "It's funny," he says, "because for one person I'll say this is a music program. For the next person, I'll say it's a social program. Even within a family, it might be a musical program for one of their kids, and for the other three, it's completely a social program. And what I mean by that is that a child can get a refinement on their instrument and be immersed in the musical culture without having to be a premier violinist." Trahey also believes the program has a positive impact on the students' academic records. "We have a rigorous assessment that tells us that," he says. "We also have found that kids that immerse themselves in OrchKids show up to school more often." Asia Palmer is currently a freshman at the Baltimore School for the Arts; she was also one of the more than 100 students from OrchKids and the Baltimore Symphony Youth Orchestra who took part in the Boléro performance in Februrary. Palmer was a student at Harriet Tubman Elementary School in 2008, when the OrchKids program was just starting there. She says the program has helped her get to where she is today. "If I hadn't started the program, I wouldn't be at my school now," she says. "And I really do enjoy my school. And I wouldn't have had the opportunity to play the flute." Palmer's mother, Lynette Fields, is a community coordinator for OrchKids. She says working with OrchKids has shown her the benefits of the program that go beyond music education. "I go on the trips with the kids," she says. "I serve snacks, and the dinner for the kids — because they get dinner before they leave in the evening. After being here all day long like that, I think it's good that we supply the dinner for them, because some of the kids may not get a full dinner when they go home in the evening."